AUSWET 600 is a general purpose wetting agent, mainly used with fungicides, insecticides and herbicides in horticulture. It has a low foam formulation, helping to reduce foaming in the spray tank when filling and assisting in reducing the risk of overflow and contamination of the outside of spray tanks with chemical residues. 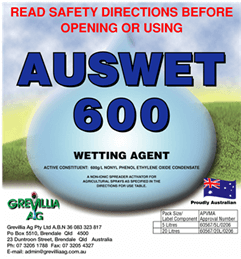 AUSWET 600 increases the activity and efficacy of pesticides and herbicides by increasing wetting and improving spray coverage. AUSWET 600 can be used with alkaline sprays and mixes easily with all types of water. It will not injure the most tender foliage if used as directed. Its low foam formaulation significnatly reduces foaming in the spray tank. Spray only to the point where leaves are just wet. Spraying beyond this will encourage run-off, with obvious loss of spray chemicals. AUSWET 600 is an effective aid to fire fighting. It increases the wetting power of water which assists in quick mopping up of fires.